In 2016, the National Parks Service (NPS) will celebrate its 100th anniversary, and radio amateurs will be able to help mark the occasion with the ARRL National Parks on the Air (NPOTA) event. The fun begins at 0000 UTC on January 1, 2016. *Sutter's Fort and the B.F. Hastings Building are administered by California State Parks, not the National Parks Service; however, NPOTA operations within 100 feet of National Historic Trails are permitted at any point along the route. Operations from private property must receive permission. See NPOTA Rules 13(k) and (m). ARRL headquarters advises amateur radio operators to contact and register with the corresponding local NPS unit administration in advance to inform them of planned NPOTA operations within their entity. Visit http://www.arrl.org/NPOTA for more information. Follow NPOTA activation updates on npota.arrl.org, Facebook and Twitter. No activations from Port Chicago will be considered. Period. Operations from these sites will need to be well-planned in advance, with full approval by the ARRL and the NPS staff of the unit in question. Unannounced activations and mobile activations from the parking lots of these units should not occur. Amateur Radio Demonstration at Northern California Ronald McDonald House Kids Day in Sacramento, California. The participants were ARRL SV Section Youth Coordinator Duane Wyatt WAØMJD, ARRL SV Section Manager Carol Milazzo KP4MD, ARES District 3 Emergency Coordinator Greg Kruckewitt KG6SJT, Paul Grose N6DRY, Dwane Evans KG6KPW, Roger Cain KI6FYF, River City ARCS VP Paul McIntyre KC5JAX, and Hunter McIntyre. The demonstration included CW contacts and phone contacts in the North American QSO Party on 20 meters using an Alinco DX-70TH and MFJ "Big Ear" antenna and 2 meter packet radio traffic exchanged with WinLink using a Yaesu FT-7900R transceiver and Kantronics KPC-3 Plus TNC. Photo album link. At the January 9 Sac County ARES Training class at the Metro Fire District Station 106, prior Sac County EC John Staples, KI6ZWW, received a gift certificate and a plaque "in appreciation for all of his time and hard work spent to improve Sacramento County ARES and RACES during 2012-2015." During his appointment, John increased ARES membership, helped the group focus on their major task - communications, and developed relationships with other counties - urging all ARES members to get to know their neighboring county ARES groups. He developed an excellent working relationship with Sacramento County Office of Emergency Operations Center. That task in and of itself is a major accomplishment. District 3 EC Greg Kruckewitt KG6SJT and Sac County Assistant EC Vince Cracchiolo KI6NHP presented the award on behalf of all the members of Sacramento County ARES/RACES and the Sacramento County Office of Emergency Services. For the year 2015, Sacramento Valley Section ARES reported 20,129 volunteer hours! Excellent job and well done. Thanks to all ARES members for your hard work and support! Commenced at 1830 hours at the Veteran’s Memorial Hall in Auburn, CA. All Officers, Board members, and other SFARC staff were present, as well as newly elected officers for 2016. After an amazing feast of turkey, ham, and many, many side dishes, President Tyghe-W6TJR welcomed the club members and their families followed by an introduction of Officers. 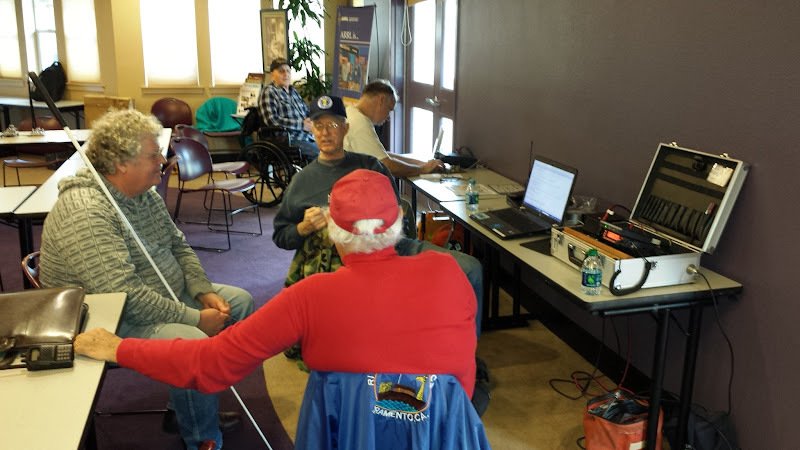 42 amateur radio operators from 6 counties worked together to support communications for the California International Marathon (CIM) December 5, 2015. The CIM hosted by the Sacramento Running Association, drew over 9000 runners for this 33rd annual marathon 26.2-mile race from Folsom to downtown Sacramento. Elite racers are able to use finish times to qualify for the Boston Marathon or Olympic Marathon trial. The Amateur radio communications teams were directed by Sacramento Valley Section Emergency Coordinator Frank Reshke N6SNO who was working his 28th CIM run. The ham radio operators provided communications via the N6ICW repeater between the seventeen Aid Stations, passing lead runner numbers to net control, as well as coordinating the tracking of runners who dropped out and needed rides to the finish line. This year radio operators were also posted on the SAG buses. This helped facilitate the tracking of the buses along the course and helped pick up runners where needed. When an Aid Station was running low on needed supplies, the ham operators passed the supply requests to the communications trailer at the finish line. Race managers were then able to direct supply trucks to the locations that needed supplies. For the first time, ham operators were also tasked with using fire department 800 mHz radios. These fire department radios were used to pass medical information from Aid Stations to the fire department personnel in the communications trailer for dispatch of medical assistance. We had a few glitches with the 800 mHz radio operations due to last minute changes by the race management, but we hope next year this will improve. A big thank you goes out to the radio operators for volunteering their time to make this event a major success. The Redding ARRL VE Team announces that our next exam session will be held on Saturday January 16th, at BloodSource in Redding. Candidates are asked to be there by 10:00 AM. We are holding our regular VE exam sessions in odd-numbered months. More information can be found at www.reddingve.com or by contacting Steve K6KS at sjmosconi@gmail.com . Test location: SHINGLETOWN AREA RESOURCE CENTER, 31268 HWY 44 SUITE C, SHINGLETOWN, CA. 96088 Next door to the Post Office. Testing begins at 10:00 AM. Candidates should arrive 15 to 30 minutes early. We accept walk ins. 47 CFR §97.313 (f) No station may transmit with a transmitter power exceeding 50 W PEP on the UHF 70 cm band from an area specified in footnote US7 to §2.106 of part 2. The indicated affected areas are specified in http://transition.fcc.gov/oet/info/maps/us7/, in the State of California within a 240-kilometer (150 mile) radius around locations at Beale Air Force Base, California (latitude 39°08' North, longitude 121°26' West). Some misconceptions about the Amateur Radio Parity Act are being circulated. Please read full information here. Happy New Year to all! Here is the latest news from our section clubs and members to ring in the New Year. You can still send January news to kp4md@arrl.org. This news page is usually updated on the weekend after your submission is received. If you haven't seen them, I encourage you to visit our website at www.arrlsacvalley.org and our Facebook and Twitter pages. The website offers multimedia content, web resource integration, ease of navigation and improved readability, especially on tablet devices. An archive of past news pages is accessible by hovering the cursor over the "Home" tab. This is a work in progress and we solicit your suggestions for improvement. We will also continue to maintain our ARRL National website page. 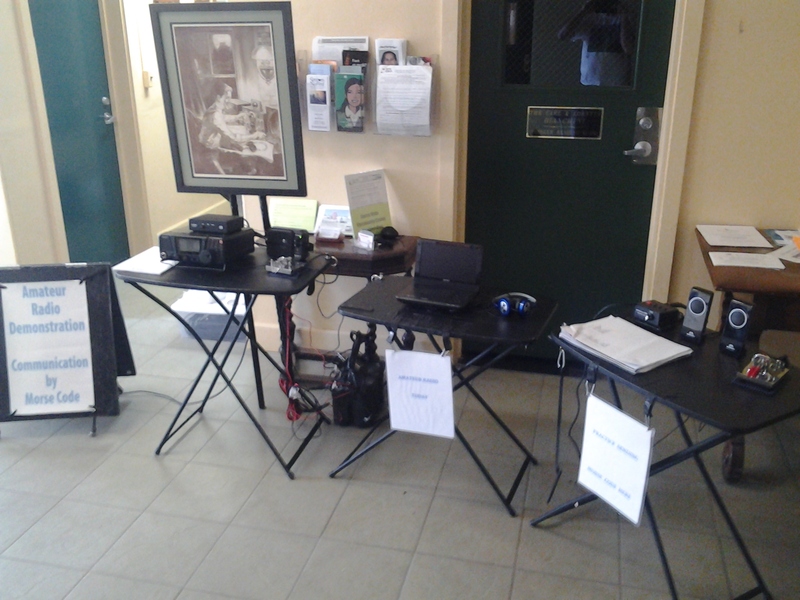 ARRL Sacramento Valley Section Youth Coordinator Duane Wyatt, WAØMJD, developed this Amateur Radio Exhibit featuring Communication by Morse Code. ARRL Sacramento Valley Section Technical Coordinator, VHF Award Manager, HF Award Manager and DXCC Award Manager Bob, WB6VYH reminds us he can count cards and check applications for VUCC and WAS and DXCC............... Bob will be at some of the Ham Swaps this year and most likely Ham Club meetings throughout Northern California. If you can't travel let Bob know and he can work something out. Please contact Bob ahead of time at wb6vyh@arrl.net or 4wortman@comcast.net for information and appointment. The Sacramento County ARES first training meeting for the year will be this Saturday, January 9, from 0900-1200 hours at the Sac Metro Fire Training Center at Station 106. The address is 2220 Park Towne Circle, Sacramento, CA 95825. The topic will be the Introduction to Emergency Communications course which is part of the Disaster Deployment Core Training. All members are urged to visit this link and download the course materials. These materials will not be available at the course. You may view the materials on a tablet, phone, laptop, or other mobile device. A quick victory lap for the K7B special event station! I helped put up a Hex antenna (looks like an umbrella that the wind turned inside out), and we had four HF stations, with a number of operators, and about 4500 QSOs (contacts) in all 50 states and 65 countries in five days. The special event Certificate is a beaut - hams can see it on QRZ.com K7B. I worked some guys in maybe 20 states, and contacted two different operators from my home QTH, so I get the Certificate with a special endorsement - whoopie! I'm London Bridge Amateur Radio Association PIO (Public Info Officer), so I got my own by-line in this article. Usually it goes under a reporter's name. I'm not in the picture bec I took 'em. The weather for the Balloon Festival was amazing this year - we were on the Lake Saturday AM, and there were over 60 balloons visible at one point. Ok, I'm bragging, but it was sure fun. Sorry. Can't wait for next year. The 2016 WPARC Kickoff Party will be this Saturday (January 23) at 6:00 PM. We have confirmed The Old Spaghetti Factory at 731 Sunrise Ave. in Roseville and we have a “party menu” to choose from for dinner. The dinner includes a crisp salad, a main pasta dish, hot fresh baked bread, spumoni ice cream, soft drink, and gratuity. There is a flat charge for this of $20 per person which is quite a deal. Make sure to mark the date in your calendar. The Kickoff Parties are a lot of fun and give us a chance to socialize outside of our regular meetings. Remember to bring your spouse/XYL/significant other. We will also have our new Section Manager, Carol KP4MD, as our special guest. In addition, we have some special drawing prizes to start the new year. Also, remember to wear your club call sign ID. NETS Wednesday and Thursday! Wednesday we have a 10:00 AM net on the club repeater, K6PAC, and as always, Katy KJ6YCP will be net control . It is a fun net and definitely growing. We will have two nets Thursday starting at 7:30 PM with the 2 meter net, followed by the HF net 5 minutes after the end of the 2 meter net. The 2 meter net will be on K6PAC, the WPARC repeater, at 147.300 (+) 179.9. Bill KJ6YCO is the new net manager. The HF net will be announced on the 2 meter net. You might have noticed that I said KJ6YCO is the new net manager. Dennis KI6HHA is giving up the post and also his position on the WPARC Board. Unfortunately, Dennis is moving to Woodland and will be reducing his participation in the club. Dennis has been an exceptionally active member, introducing some valuable changes, starting a VE Team, and just generally working to make the club better. Please join me in thanking Dennis for all the effort he has put into the club and to wish him the best in his new QTH. Michael K6BUK – Secretary/Treasurer (we had to combine the Secretary and Treasurer positions due to lack of interest). If you know of any other Ham Swaps, Hamfests, or any other ham related events in northern California or western Nevada, email me and I will add them to the newsletter. GREETINGS. WELCOME TO THE NEW YEAR !! Our meeting is Wednesday, January 13th. Lunch is at eleven and Denny's also serves breakfast all day. As usual the meeting will be called to order at Noon in the restaurant's back room. The program for this month is a short video on operating ham radio from the International Space Station. It’s the start of 2016 and I hope all will have a great new year. At the last Board meeting we began planning for the programs and activities we will have throughout the year. Already we have reserved our Field Day site in Rio Linda thanks to Paul, N6DRY. At this time we have 43 paid members. If you haven’t paid your dues yet, you can renew with PayPal on our web page. I’m looking forward to our January meeting to learn more about Summits on the Air (SOTA). Jordan Heichman, KJ6NHF will be our featured speaker and hopefully encourage us to complete some New Year’s resolutions with this interesting activity. In February, Andy, W6AWS and Chris, N6ICW will discuss repeater function and design. I think our system will be the center of the discussion. Also in February on the 20th, we will be helping new hams who enjoy 4wd program their new radios. If you are available at the Marriott Rancho Cordova from 10-4 to help, let one of the officers or Board members know. In March, Phil Sittner, KD6RM will demonstrate his 80 and 40 meter mag loop antenna. For those in antenna restricted neighborhoods, this may prove to be useful to keep on the air. Remember that our trailer will be at the January meeting so members can clear Club “stuff” out of their QTH and have it safely stored and available. Our net control operators are keeping a list of program ideas for future meetings. Check in to the net and help us make plans for the future. I think it will be another good year for the NCARC -- we continue to get new members and, as usual, there is lots and lots of technical expertise and experience in the membership. Let me start the new year off by thanking the club officers of 2015: Larry Latta, K6LRL was our vice-president; Chuck Murphey, KI6CM, was our treasurer; Jon Gicker, WA6TNC, was our secretary. We also had as board members: Doc Dashiell, NM6K; Dave Tannenbaum, AA6DT; Al Helberg, AA7C. I have to say that with these officers and board members, the president’s job was a LOT easier. Larry Latta took on the meeting raffles and finagled some very nice goodies for the raffle. While Larry is relatively new to ham radio, he has jumped in with both feet and is always ready to take on more responsibility and duties. Chuck Murphey, who has been the treasurer for the last 7-8 years, and Jon Gicker, who has been secretary for the last 8-9 years, are the two who kept the club going administratively. Chuck handles the finances such as collecting club dues and paying all the bills, as well as preparing a budget and making sure we follow it (I get in a bit of trouble when I submit my Christmas dinner items invoice after the year’s end). As I’ve mentioned previously, Chuck also does a lot more stuff for the club – e.g. collecting the mail at our P.O. Box, arranging for club liability insurance, collecting donated stuff, coordinating with the Salvation Army. He is also the point-of-contact for the club – when someone uses the “contact” tab on our website, that message goes to Chuck who then handles it or forwards it to the appropriate person. Jon Gicker takes the club meeting minutes and not only writes them up so that us old-timers can remember what we did at a meeting and what we said we would do for the next meeting, but also adds his own special writing style which makes an otherwise somewhat bland document interesting and entertaining. In addition, Jon also handles general correspondence and sends out condolences when we find out a club member is a SK (silent key) and get well cards. The board members have also been exemplary. Doc Dashiell has been preparing the club newsletter now for a couple of years. And, the newsletter is one of those things that really helps the club. Besides being the means by which we maintain our history, it is interesting and entertaining, especially with Jon’s meeting minutes. Plus, with Doc getting it out a few days before a meeting, it is a reminder to members for the meetings as well as upcoming events. Dave Tannebaum has been THE man who gets us all those fabulous technical presentation we’ve been having. It isn’t apparent to you, but this takes lots and lots of time and effort. He has to research potential topics and then contact (and re-contact) many people before he gets someone who has a good topic and is willing to come to Grass Valley and give the presentation. This brings us to Al Helberg, basically our “steath” club and board member. You’ll see Al sitting up front at meetings with an occasional comment or suggestion, but he is always helping with just about everything. Any event --he will be there; the club needs something -- he looks into what is needed and then gets it; someone asks a question or wants a signal check on the repeater -- he is probably the guy who comes back. The projector we use for presentations is Al’s and the safe in the radio room where we keep valuables (after a couple of break-ins at the Salvation Army) is also his. I almost hate to ask him to do anything because I know he will and he’s already done so much for the club. So, once again, Thank You to the 2015 officers and board members. And that brings us to the candidates for 2016. President: Larry Latta; VP: me -- Note: Larry will be out of the area for few months of the year and so I’ll be filling in for him at meetings and such; Treasurer: John Hart; Secretary: Jon Gicker (who has offered to do this for the 9th -10th consecutive year, but would really like to get some help and eventually turn this over to someone else). We’ll present this list of candidates at the meeting and after any discussion, we’ll vote to make them official. Next, I wanted to talk about our Christmas Dinner/Meeting. I think it went very well. We were worried a bit when we found out, the day of the meeting, that the Salvation Army needed our usual meeting area for a cold-weather shelter and asked us to hold our dinner/meeting in the church. Fortunately, the Salvation Army staff turned the church space into an excellent meeting area for us. There were lots of great dishes and I think everybody enjoyed a good meal and had a nice time. Towards the end of the evening, we held the drawing for the Kenwood TH-F6A Tri-Band handheld and the winner was . . . Alan James, KZ6B. Later, when Chuck counted the receipts for raffle tickets, we had more than paid for the prize which means there was a nice chunk of change to start the 2016 raffle season. Thank you everybody for participating and helping. The January meeting will mostly club business – we elect the officers for 2016, review and approve the budget and then talk about events we’d like to have during the year and other things we might do at future meetings. For example, I wanted to talk about stuff the club been given over the last few years . We still have lots of items many of them might be of interest to you. I think we can offer them for sale at a meeting, at very reasonable prices. This way we can get some items to people who could use them and also add a few more $$$ to the club funds. That’s all for this month. Hope to see you at the meeting. Attendance: A goodly number This meeting was the Club's annual Holiday Party, and because it was a cold night, the Salvation Army opened the meeting room as a homeless shelter and moved us into the church itself. The Salvation Army people set up tables for us and we had our dinner there. It was a perfectly-sized space for us, and I think everyone is very grateful for the Army's hospitality on short notice and for which we thank them. Of course, the church itself is a more formal venue than the meeting hall and I think that was reflected in a slightly less exuberant party than is usual. (No dancing with lampshades on our heads over there!) But your Secretary had a lovely time and I'm sure everyone else did, too. Alan, KZ6B, will no doubt remember the event fondly, as he was the winner of the new radio! The food, as always, was delicious, and thanks go to all the chefs and dishwashers (your Secretary is a dishwasher, obviously), who were responsible for its production. And, it was pleasant to have numerous family members there. And with that cheerful note, this edition of unofficial minutes draws to a conclusion. May we all have a good 2016! Respectfully submitted by Jon, WA6TNC, NCARC Secretary. Update from the Golden Empire ARS "Radiator"
Happy New Year everyone! I look forward to serving as your club president this year, looking at this as a privilege and honor to fill this position in our club that has been a large part of the amateur community since 1939. We have a rich heritage of some amazing amateurs that have filled the airwaves with their voices, code and other modes both now and in years gone by. I encourage you to contact me or the other Board members with your ideas and suggestions in what GEARS means to you, what you hope for and how you would like to be a part of our club. I intend to lead the club in growing in membership, participation and outreach into the local communities. One of the ways to do this is that I commit to making our monthly meetings fun, educational, inspiring and memorable. Our club is blessed to currently have 70 members. If we were to accumulate the years of knowledge and experience on the air and at the workbench we would be amazed. I hope that we can make the most of these talents to help each other, to foster friendships on and off the air, and very importantly to help the new Hams to learn and experience all that they can in this incredible hobby that we are part of. We will be changing a bit in that the Board meetings will now be held on the 2nd Saturday of each month at 2:00 pm. The January Board meeting will be held on Saturday the 9th at Blood Source, 555 Rio Lindo Ave. All members are welcome and encouraged to attend Board meetings. At the General Meetings on the 3rd Friday each month I encourage you to show up for social eye-ball QSO’s and rag-chewing in with others starting at 6:30. The meeting will start promptly at 7:00 with lots of fun, information, interaction and guest speakers. If there are areas that you would like to help out in our club please let me know. The Board members cannot do it all. Helen Keller once said, “Alone we can do so little, together we can do so much.” Let’s join together in raising our club and amateur radio in the area to new heights, let’s crank the tower ALL of the way up together. As some of you know, I recently installed an 80’ crank-up tower at my QTH. But did “I”? No, but with the help of many of you it now stands proudly among my pine trees. The first day we soon found that there were not enough of us to raise it up. The next day, with more willing Hams present it was a much easier task and we had fun working together toward a goal. Our club is the same way -we can join together in raising GEARS to new heights. We are fortunate to have very good club repeaters on 2 meters and 440 with a wide coverage area. Be sure to I.D. when you are monitoring, you just never know who else is out there monitoring, ready to have a QSO! The Tuesday night net on the 2 meter repeater can only be as good as those that check-in and participate – let’s share our ham activities there! The W6SFM Samuel F. Morse ARC welcomed 11 members and 2 guests to this months SFMARC in-person monthly meeting. This month we greeted our newest member Bob Schuldheiz, K6DGQ from Sacramento, and our guests Ward Myer of Fair Oaks and Andrew Silvester, N6REW of Fair Oaks, CA. Also, a big thank you to all who have helped support the club and the preservation of CW on the bands! All members of the SFM ARC receive a W6SFM.COM email addresses and personal Member webpage where they can proudly display their bios to the public. We encourage our members to post news, photos and other information about themselves as well as their hobbies. Feel free to visit our new member’s page found in the members section of the W6SFM website for a look into them. SFM ARC President Mike, N6MQL called this months meeting to order. Mike read the month’s budget report and announced the final funds available, Including $90 donations presented to Mike N6MQL by the CW Class members at the conclusion of the CW Beginners class. Those who donated asked that $70 of the 90 please be donated to the Church where the classes are held. This was done in consideration of the church providing both the SFM ARC a home for their meetings, and a place for the CW classes to take place, all without charging the club. The remaining $30 total will be used for the purpose of organizing PR booths such as the Kids Day in the Park event, Ranch Cordova and other events where the SFM ARC introduces Ham Radio and Morse Code to Children and the general public. If you would like to contribute to this cause please feel free to visit our home page for a PayPal link to donate. Chris, AI6U proceeded to read in last months meeting notes and the totals for our On-line / On-air net meetings for the month. Once again we’re getting good check-ins both on-air and on-line. We had a total of 25 QNI on-air and 13 On-line viewers! Keep those check ins coming. We love to hear about your current weeks happenings. Net meetings offer a way for club members and guests to get together between in-person meetings. Especially for those that are out of town. Topics of Discussion included the final tally on those completing the W6SFM CW Class November 18th. It was announced that 5 of the class students were receiving at speeds over 16 WPM. One student was clocked at around 22 WPM speeds! This is exceptional for someone to go from 0 WPM speed to 22 WPM within a 10 week course. Of the other 17 students some were clocked at around 10-15 WPM code speeds. The remaining students had all learned their complete Morse Alphabet, Numbers and Pro-signs, however they were not at conversational speeds. Those students who wish to take the CW class again next time are welcome and encouraged to. Plus, they will all be able to do so for a very reduced rate since they now have their provided Straight key, and Oscillator given to them FREE with their original class payment. Also at this in-person meeting the group discussed the W6SFM Bug Roundup Event and how well those participating did on-air. The CQ BR event was held November 21-22nd. just before our December in-person meeting. Members reported making many contacts, some with DX stations in Asia and Europe. It was also announced that a total of 1008 people checked into the Club’s “Bug Roundup Event” web page between the first announcement 1 month prior to the event, and the end of the event on Sunday Morning at 7AM. Next month (January) marks the on-air North American QSO party contest. The SFM ARC always participates in this event held 1800 – 0600 UTC. January’s event will be held on the 9th – 10th. Member, Bob KJ6** has graciously offered to host this event at his home QTH in Fair Oaks, CA. All those who are interested in attending (operating or not) please be sure to contact admin@w6sfm.com with your RSVP so we have enough snacks and drinks for everyone there. Directions will be given at our next in-person meeting held the first Thursday of the month, January 7th. We hope to see you there. .
Our next SFM ARC in-person meeting will be held at its normal time and address. Our upcoming January 7th (followed by our February 4th) SFM ARC in-person meeting will be held in the Howard Crowley room upstairs. Current events, News regarding Amateur radio and other ARRL items will be discussed. As always we will have our Tech portion where members and visitors are asked to share their Ham Radio related items they find of interest. Feel free to visit our In-Person meeting with items that you purchased or were given that you would like to share with the group. Please note that the SFM ARC will also be holding our general elections for Club Officers. Positions include President, Vice President, and Secretary. Also we will be collecting yearly membership dues for the 2016 year. If you would like to join us, and want the full benefit of the complete year this would be the time to apply. Please use our on-line “Join W6SFM” link on our homepage to do so. Each Tuesday of the week 8:00 PM on 3.545 MHz the SFM ARC enjoys getting on the air with CW for our weekly Nets. You do NOT need to be a member of the SFM ARC to check into our nets. Although our nets usually run around 13 wpm code, we are all happy to accommodate those that are slower and need us to oblige. If you are unable to copy Morse Code or need some code practice please feel free to visit our on-line LIVE streaming broadcast of both the Audio and a CW to Text decoding of the meeting. That link can be found on our home page of the website. Those visiting the on-line site at www.w6sfm.com are welcome to make themselves known by using the ‘contact us’ link to let the net op (NCS) know you are there. This of course is not mandatory; just a way of making everyone feel more involved in our on-air nets. Do you or someone you know need a Ham Club to call home? For those that want to learn Morse Code, are interested in CW or already know and use it, the SFM ARC would love to be your new Club home. Our in-person meetings are held each 1st Thursday of the month at 7PM. The SFM ARC meets in the "Howard Crowley" room of the Carmichael Presbyterian Church in Carmichael, CA. The church is Located at 5645 Marconi Ave. For directions to the meeting visit our clubs home webpage www.w6sfm.com. Please use the rear parking lot and entry for best access to the meeting. A map and directions can also be found on our website. At the December 9 general meeting of the Yuba Sutter ARC, we dispensed with the serious part of our meeting and enjoyed each others company at Hometown Buffet. The crowd was estimated at 82, though we used all the seats allotted and a few overflow booths as well. A door prize drawing was held and each attendee got a free ticket. When YSARC officers and board members were elected in November the office of Secretary was left open. That has been rectified by Linda Maas, KK6SOZ. She was appointed by a vote of the Board of Directors at the December board meeting December 15. She will succeed Jo Anne Murdock, N6YLO, who will be traveling frequently in 2016 with Ron, W6KJ. YSARC will offer a free license class starting early in January. Curtis, KF6VFP, and Ron, W6KJ, will be the primary instructors. Contact Curtis at kf6vfp@arrl.net for more details. Wow! What a year. It has been an honor serving as your president for this year. I owe my gratitude to numerous people for making this such a successful year for the club. When I chose to throw my hat into the ring my only intention was to get more people involved in our great club. Everyone stepped and as a result we have many examples of club successes for which we can/should be rightfully proud. Field day was attended by one of the largest groups in anyone’s recollection. Ham radio, food, and entertainment for all. Many informative, well attended presentations were held at the public library meeting room. And to cap off the year... a Christmas party attended by over 100 people featuring food, friendship, good company and great door prizes. Again a resounding success due primarily to the work and preparations of David Wainer, WA1NER. It was my hope as president to move us toward more of a technical type club. Perhaps a better balance as a social club as well may have been a better path. The new president will make that decision and I encourage everyone to support him as well as you have supported me. ALWAYS remember, we are a club of volunteers serving you with your gratitude as our only payment. I wish to give the board and officers my heartfelt thanks for their support and patience. To vice-president Ted, KN6TED who stepped up and assumed control of the club when work called me away for those months, thank you so much. Well Done! Please do your part in support of the club in the coming year in whatever manner you can. I promise to do the same. Sorry I missed sending a November input from the Oroville area. This one is intended to cover last month and this one. OARS (http://w6af.org) provided communications support for the Oroville Veterans Day Parade on 11 November. Club participants included Ron Osborne, KD7UHF; Joe Herman, WA6CAL; Bennett Laskey, K6CEL; Bill Curran, AG6ZT; Gary Clark, KF6EWO; Stan and Marilyn Meadows, KN7ZYZ and KK6GNL; Ted Cochran, KK6VHZ; Terry Sturmey, KB6TR and Jim Jennings, W7XZ. The weather was a little on the cool side, but sunny. The November meeting of OARS was held on the 13th (the customary second Friday of the month), with on the order of 18 attending. The first item on the agenda was a report on the club's activity in the parade two days before, and a consensus that it went quite well. There was also a call for numbers of people planning to attend the club's Christmas dinner scheduled for 5 December. For the program, Lee Hutchins, KA6IRL, presented a video of a film produced during World War II, called "Crystals Go to War," showing the process of manufacturing crystals for use in military radio equipment of the era. It was also decided at the meeting to forego the monthly club breakfast for December, as the last Saturday of the month would be the day after Christmas, but more on that below. The third annual OARS Christmas Dinner took place on 5 December at Blueberry Twist Restaurant in Oroville with 41 members and family coming to the event. The prizes in the drawing after dinner included some ARRL publications and, for the ladies, some towels and other articles beautifully embroidered by Marilyn, KK6GNL. The December OARS meeting took place on the 11th with 21 in attendance. The club gained three new members that evening: Sharry Hope, KK6YMI (newly licensed); Richard Burkes, KG6IFM and Albert Leyva, N6YCK (currently President of Glenn Amateur Radio Society). Nomination of 2016 officers was the top agenda item, and by meeting's end there was at least one name for every office. The election will be held at the January 2016 meeting. There was no program per se, but former Treasurer Bob Oden, K6RCO, now a Minnesota resident, was visiting the area and celebrated his 80th birthday with the club that evening, and cake was served. With his departure from our town (and time zone), the duties of Treasurer for the interim were assumed by Larry Thompson, W6LAT. When it was agreed at the November meeting to forego the December monthly breakfast, John Hunt, K7XE (first President and a major participant in reawakening the dormant OARS in late 2006), said he would be going to breakfast that morning at the usual place anyway. Consequently, 14 came to the "unbreakfast" on 26 December at The Waffle Shop. A Happy Birthday to John, who has just turned 90 this final week of December. The OARS Sunday Night Net, 8 pm Sundays, on the OARS Repeater (146.655 MHz, - offset, 136.5 Hz CTCSS), was graced by the YL voice of Sharry, KK6YMI, on the 27th, and she was welcomed to the group by all who checked in. The repeater is also accessible via EchoLink (K6ZRX-L). Visitors are always welcome. OARS will hold its January 2016 meeting on the 8th, 7 pm, St. Paul's Parish Hall, 1430 Pine Street in Oroville (doors open at 6 pm for social hour). The top agenda item is election of officers for 2016. The scheduled program is to be about Broadband-Hamnet, presented by Joe, WA6CAL. PS Another League dues increase? Glad I got my life membership back in early 1977 when dues were only $20/year. My plaque bears my old call, K6ILB, which I'd held since 1955. A month or so after receiving it, my new call, W7XZ, came through from the FCC. Leaving Nevada in 2006 (long story), I returned to the very QTH of K6ILB here in Oroville, the old family home, so I've gone full circle. Will still hang on to W7XZ. Have a great 2016. The December WPARC meeting was 7:00 PM 12/15/2015 at the Woodcreek Oaks Golf Club in Roseville. Many people come to the meeting early to eat, drink, and enjoy great conversation. We will be electing new officers for 2016 so make sure you turn out to vote. Ron Green KG6RLG will be the presenter this month. The December meeting means it is time to pay 2016 membership dues. For the 10th year in a row we have not increased the cost of club membership. Club Treasurer, Scott KJ6FAV, emailed a form for paying dues but if you didn't receive it, you can email Scott or me. Please bring your form and check to the December meeting. We will also have forms available there if you did not receive one. If you can't make the meeting you can mail your dues to our Post Office box: WPARC, P.O. Box 1173, Lincoln CA 95648. Thanks in advance for paying your dues on time! Also, please check your email address on this newsletter to make sure we have your preferred address. If not, send the correct one to Scott or me. Sunday we had a good storm with lots of wind. I wanted to see what the peak wind gust was during the storm but our power went off about 10:30 AM and the weather station couldn't report to the computer in my shack nor could it update the internet. Fortunately, the station console has a battery backup with memory for peaks and the high was 37 MPH. I looked out at the hummingbird feeders in my back yard when the storm was its worst and those crazy birds were flying around like it was a sunny day! PG&E sent out a telephone message that our power should be restored by noon due to all the outages from the wind. I was a little doubtful but the power came back on exactly at noon. December 31 – 10 Meters (28.410 MHz) A good chance for Techs to join in! January 7 2016 – 10 Meters (28.410 MHz) A good chance for Techs to join in! Now that we have the repeater in a good location that gives us a strong signal in western Placer County, I expected that we would see an increase in net participation. However, recently our check in numbers have been declining. If you have any suggestions on how to improve the net please email Dennis KI6HHA at ki6hha@aol.com or me. Remember to keep your radio tuned to the club repeater during the day. We need to use the repeater as much as we can, especially now that it is in such a good location. I know Claire KI6VWG, Ron KG6RLG, and I often monitor the repeater and are waiting for you to call. Welcome to new club member Russell Steel KF6TAR! I haven't seen Russell's application yet so I don't know what his areas of interest are but please introduce yourself to him when you see him at a meeting and welcome him into the club. We have the date for the 2016 Kickoff Party. It will be Saturday January 23. We have confirmed The Old Spaghetti Factory at 731 Sunrise Ave. in Roseville and we have a “party menu” to choose from for dinner. The dinner includes a crisp salad, a main pasta dish, hot fresh baked bread, spumoni ice cream, soft drink, and gratuity. There is a flat charge for this of $20 per person which is quite a deal. At the Board meeting last week it was decided to collect the $20 at the door instead of at the January meeting. Please email me as soon as possible so we have an idea of how many people plan to attend. The menu will be on the web site soon. Make sure to mark the date in your calendar. The Kickoff Parties are a lot of fun and give us a chance to socialize outside of our regular meetings. Remember to bring your spouse/XYL/significant other. We will also have our new Section Manager, Carol KP4MD, as our special guest. In addition, we have some special drawing prizes to start the new year. The Sacramento Amateur Radio Club (SARC), held their annual holiday Meeting on Dec 9th. Business was short w/elections and then pizza and a jolly good BS session afterwards 'till aboutt 8:45 PM.